When it comes to the animal kingdom, we cover a very wide swath of both the familiar Earthly animals as well as the broad range of mythical and magical animals. From the smallest germs to the massive Krakens. 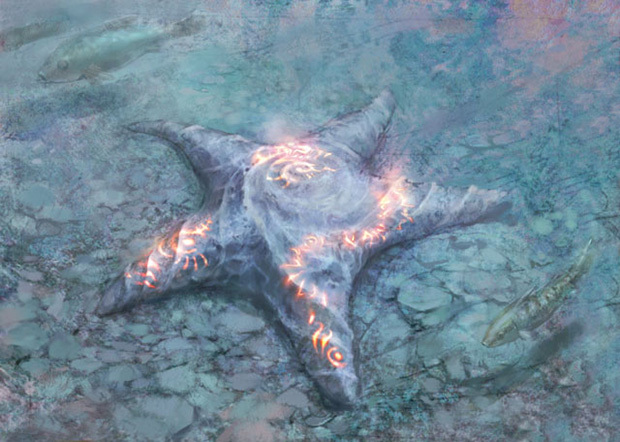 Today though we're going to look at a rather small branch of Magic's creature tree of life: Echinoderms. Echinoderms are a phylum of marine animals where the animals are recognizeable by their "radial symmetry" to include sea urchins, sand dollars, sea cucumbers, and... starfish! 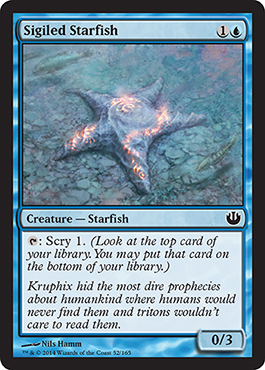 Fairly early in Journey into Nyx previews we revealed Sigiled Starfish, which was immediately dubbed "Scryfish" by the community. It's a fun little 0/3 which will prove quite prevalent in limited I think. It provides a decent early blocker while allowing you to potentially repeatedly scry as you try to gain the upper hand early in your games. But Sigiled Starfish is not our first echinoderm in Magic, that distinction goes to Spiny Starfish from Alliances.